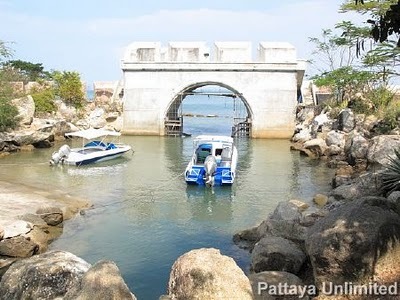 At the time of writing this post the basic admission/entry price at The Sanctuary of Truth was 500 Thai Baht plus 200 Thai baht to take a speedboat ride and get a view from the sea, there is a discounted price for children. Get discounted entry/admission tickets to The Sanctuary of Truth in Pattaya. 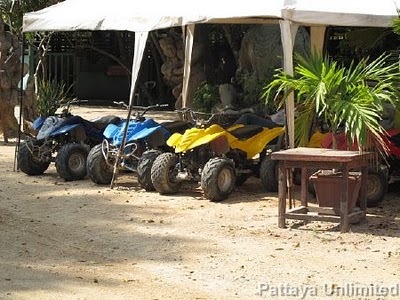 Read this Pattaya online tour and entry ticket booking guide and find the cheapest entry tickets to the Sanctuary of Truth and all the best places to go and things to do in Pattaya. 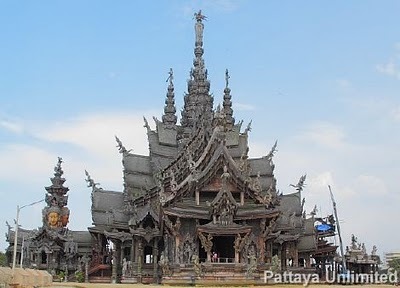 The Sanctuary Of Truth is one of the most famous tourist attractions in Pattaya, but is it one the best rated things to see and do in Pattaya. 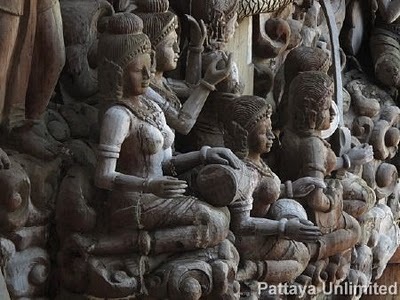 As you will see when you scroll down to view the photos below, The Sanctuary of Truth is definitely one of the most beautiful Pattaya tourist attractions and has an authentic Thai look and feel similar to Pattaya Floating Market. In fact I would say it is the most beautiful building in Pattaya. The Sanctuary of Truth, Pattaya Thailand. 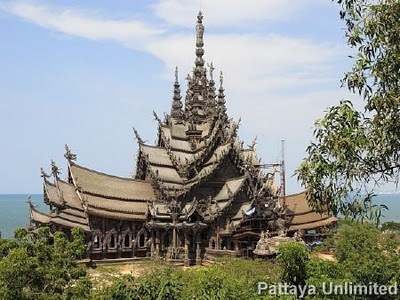 This magnificent wooden structure is also referred to as Wang Boran and Prasat Mai and was the brainchild of local businessman Lek Vinyaphant, construction of the sanctuary of Truth began in 1981 and is not expected to be finished until the year 2025. The Sanctuary of Truth is constructed purely from wood using traditional Thai woodworking techniques. Viewed from the inside and the outside this is a building of outstanding beauty. 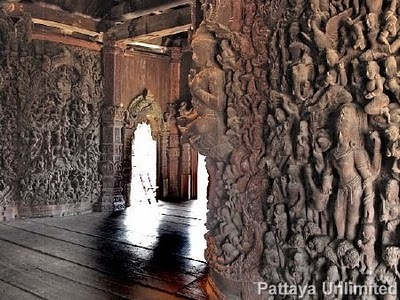 Thai wood sculpture at it’s best. Thousands of wooden sculptures adorn the interior walls of the Sanctuary of Truth, these sculptures are said to represent the seven creators, Heaven, Earth, Moon, Father, Mother, Sun and Stars. The Sanctuary of Truth is 105 meters tall and set in 2 rai of land. Standing over 105 meters tall the Sanctuary of Truth has the look and feel of a temple, There are four main spires on the top, (some of which you can see in the photo above) these hold aloft figures of Deva and other celestial figures, the figure on the topmost spire is Kalaki. 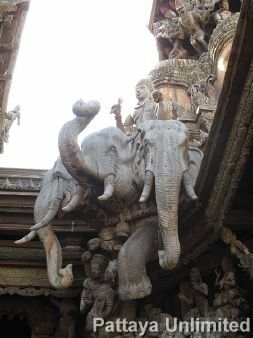 Indra sat astride the three headed elephant ‘Erawan’. 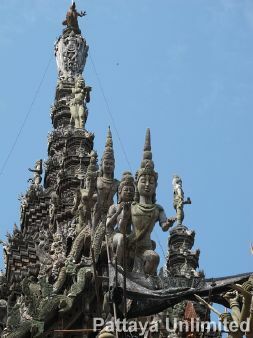 You will see many familiar looking sculptures like this one in the photo above, I believe this is the Hindu God Indra sat astride the three headed elephant known as Erawan. The four faces Brahma on top of the front pavilion, Brahma is a Hindu God who you may be familiar with, he sits inside many spirit houses outside hotels, banks and other large establishments, these particular spirit houses are known as San Phra Phroom or San Phra Brahm. 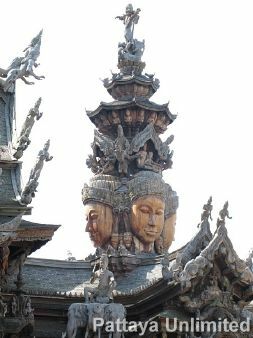 Wooden sculptures of celestial bodies appear to be flying down the spines of the roof of the Sanctuary of truth. Don’t forget your camera, like I said earlier this is probably the most beautiful building in Pattaya and is wonderfully photogenic. There’s always a pestle and mortar close to hand, anyone for Somtam ?. 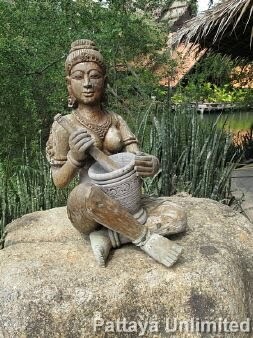 One of those typically Thai things, a pestle and mortar, this one is in the vicinity of the restaurant. All Terrain Vehicles for hire at the Sanctuary of Truth. Other things at the Sanctuary of Truth include A.T.V’s and a couple elephants, You can also make use of the Pony and Trap to take you round. There are various pricing options for the use of the A.T.V’s and Pony and trap tours. Take a speedboat ride from the Sanctuary of Truth. Get directions with the Google Sanctuary of Truth map.